ARNULF, an advisor to the Austrasian King Théodebert II, whose wife had either died or entered a monastery. When the See of Metz became vacant, St.. Arnulf was chosen by popular demand of both the clergy and laity to be their bishop. St.. Arnulf served his flock for nine years, then resigned to spend what was left of his life as a hermit, living in a cave in the Vosges mountains. St.. Arnulf reposed circa 640. EDBURGH (EDBURGA) of BICESTER, a daughter of the great pagan warrior Penda King of Mercia, St.. Edburga of Bicester converted to Christianity in her youth and spent most of her life as nun. Following her repose, circa 650, her relics were buried at Bicester. There is a shrine dedicated to her at St.anton Harcourt, Oxfordshire, England. FREDERICK, grandson of King Radbon of the Frisians (r. c.680 – 719), St.. Frederick was ninth Bishop of Utrecht, serving from circa 820 – 835. While bishop, St.. Frederick worked to regularise Church practice and reform the clergy of his See. He also sent a group led by St.. Odulph (12th June) to evangelise the area of Walcheren, whose inhabitants were given to incestuous relationships, which St.. Frederick vigorously condemned. He also reproved Empress Judith’s immoral lifestyle. St.. Frederick was murdered whilst in church on 18th July, 838. It is widely thought his murder was ordered by some of those he had condemned, though this is not known for certain. GONERI, a sixth century British hermit in Brittany. His hermitage is said to have been near the town of Tréguier. GUNDENIS, according to the Roman Martyrology , St.. Gundenis was a young maiden in Carthage who, in 203, was subjected to extensive torture and finally beheaded for refusing to renounce Christ. MARINA, (Date Unknown), a martyr in Orense in present-day Spain of whom there is no further information extant. MATERNUS, chosen eighth Bishop of Milan by popular acclamation in 295, he is said to have been loved by Christian and pagan alike. St.. Maternus was subjected to torture during the Diocletianic Persecution, yet not only survived, but provided comfort and encouragement to his flock as they too faced persecution and martyrdom. St.. Maternus reposed of natural causes circa 307. MINNBORINUS, an Irishman, most likely a member of the group of Christians which came from Ireland and Scotland to evangelise the area that is present-day Germany. St.. Minnborinus served as Abbot of the Abbey of Great St.. Martin in Cologne from 974 until his repose 986. PHILASTRIUS, Bishop of Brescia during the height of the Arian heresey. He preached extensively and authored a refutation of Arianism (Diversarum Hereseon Liber) which is still available. St.. Philastrius reposed circa 387. His successor, St.. Gaudentius (25th October), preached a sermon on an anniversary of St.. Philastrius’ repose in which he praised St.. Philastrius as “patient, good to the poor, merciful and affable to all”. RUFILLUS (RUFFILIUS), the first Bishop of Forlimpopoli in Emilia. According to tradition he was sent to evangelise the region by Pope St.. Silvester (31st December), he reposed 382. 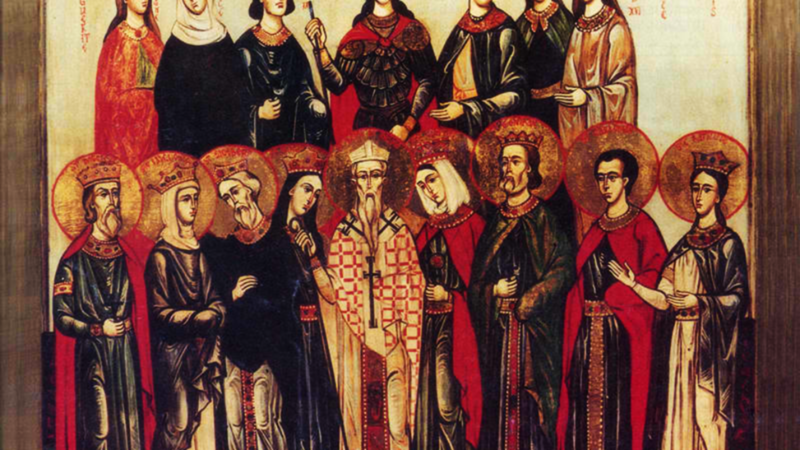 SYMPHOROSA and COMPANIONS, a widow of the martyr St.. Getulius (10th June). St.. Symphorosa was martyred in the early second century at Tivoli, and is commemorated together with Crescens, Julian, Nemesius, Primitivus, Justin, St.racteus, and Eugene, also martyrs, who may very well have been her sons. THENEVA (THENEW THENOVA, DWYNWEN), (Seventh Century) St.. Theneva is believed to have been the mother of St.. Kentigern Mungo (13th January). There are many legends about her of questionable veracity, and most of what is known of her life is derived from hagiographies of her son. She is co-patron saint, along with her son, of Glasgow, Scotland; the Enoch in St.. Enoch’s Square, Glasgow, is a corruption of her name (Saintteneu = Saintenoch); and the square stands on the site of a medieval chapel dedicated to her.